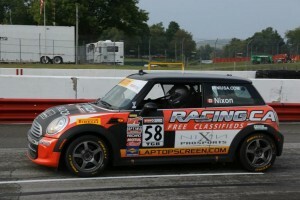 TC, TCA, TCB Rounds 9 and 10 took place on Aug 1-3 at the 2.2 mile long Mid-Ohio Sports Car Course near Lexington, Ohio. This was the first-time visit to this track for both Racing.ca team drivers Andrei and Glenn. After a productive test session which involved varying suspension settings and tire pressures guys delivered solid qualifying results with Andrei Kisel placing 4th and Glenn Nixon 6th fastest laps which were then later promoted to a 3rd and 5th respectively after the pole setter failed to pass the post-qualifying technical inspection. The first 40 minutes of the race saw mixed conditions, as the rain started to come down when both cars were already on the pre-grid. It was Glenn Nixon in #58 Racing.ca / LaptopScreen.com / Nixon Prosports Mini Cooper who made a brilliant start from the 5th position on the grid exiting the first turn in the lead! As the race progressed only the local veteran John Heinricy in #35 Chevrolet Sonic and the eventual race winner Tyler Palmer in #37 Mini Cooper had managed to pass Glenn resulting in Glenn’s brining the car to the finish line in a fantastic third place, making it 3 podium finishes for him in as many races! At the same time for Andrei team made a brave decision to change tires from slicks to rains as a pace car stayed out for an extra 2 laps, however the tire change took longer than usual and Andrei found himself one lap down when the green flag dropped. At the opening laps the tire change seemed to have been paying off; however 15 minutes into the race the rain stopped drying the track out, which completely stomped on Andrei’s progress. Second race was dry from start to finish. Glenn placed solid 6th after a race-long battle with the #65 Honda Fit of Paul Holton; Andrei placed right behind in 8th place after starting-out last. Tyler Palmer, the best finishing Mini Cooper driver, arrived in 4th which probably indicates that Mid – Ohio is better suited for the Hondas and the Fords rather than the Mini in the TCB class. The next two TC, TCA, TCB rounds of Pirelli World Challenge will take place Aug 30,31 at Brainerd International Raceway.